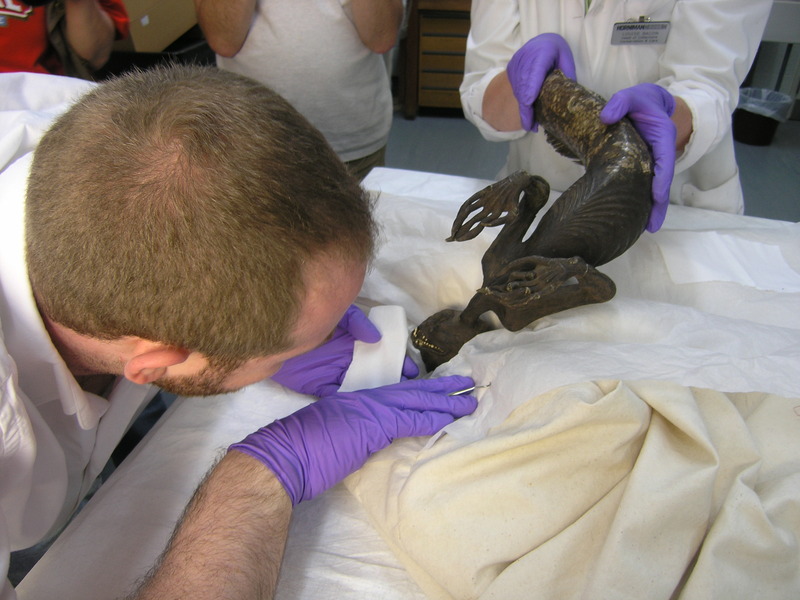 As you may already know, I’ve been doing a lot of work on a mermaid specimen in the collections of the Horniman Museum & Gardens over the last few years. The upshot of all that activity is that I have a paper written in a journal that will be hitting the bookshelves any day now. 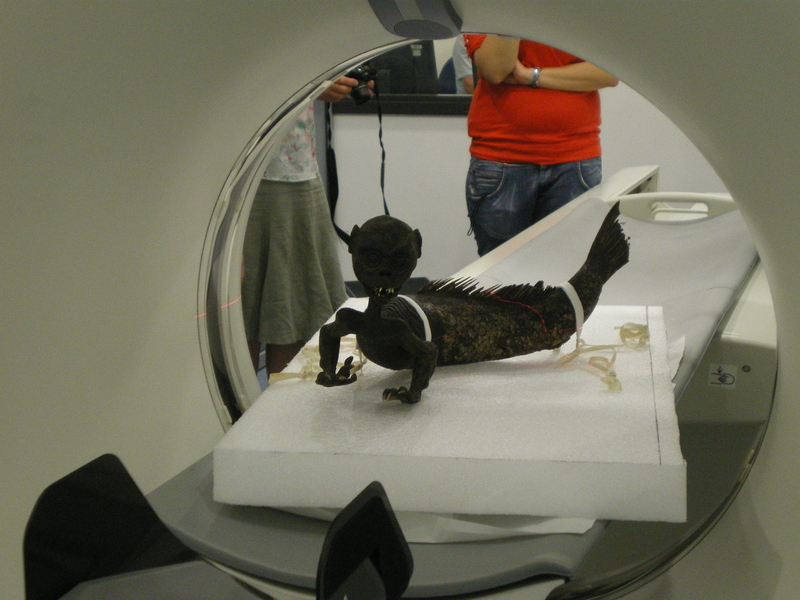 As you may have heard me say before, the specimen is not made of a monkey attached to a fish – I know that after undertaking painstaking examination of the specimen using CT scanning equipment and DNA sampling and good old fashioned anatomical investigation. Instead it appears to be a real creature of uncertain taxonomic affiliation. 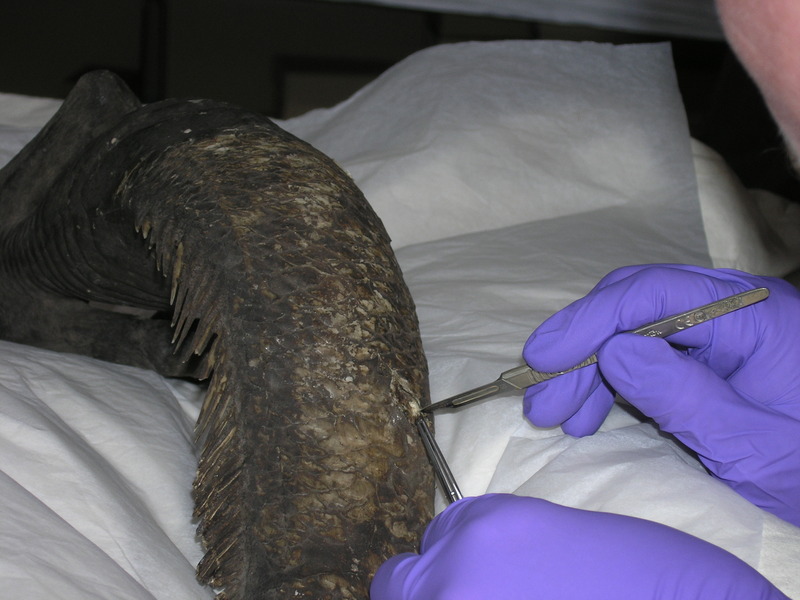 The teeth suggest a link to the Wrasse family, the tail to the Carp and the torso to no known living group, so I have designated this specimen as the type for its species and have named it Pseudosiren paradoxoides. Full details can be found in the paper which is due out next week in the Journal of Museum Ethnography – I’m so excited! There will be more info when the paper comes out, including a blogpost for the Wellcome Collection, since that’s where the specimen came to us from and Ross MacFarlane from the Wellcome Library is one of the coauthors. The timing of your post is too funny!! While visiting relatives I had an opportunity to watch television. I don’t have one at home so to ‘surf’ and see what is available is always interesting and increasingly terrifying. Here in the States there is a channel called Animal Planet that apparently was a source for documentaries about animals. No longer. Between the reality programs were two, not one but two, programs about mermaids. My wife made me watch them and I was horrified – pictures, cell phone videos, fancy computer graphics and people with PhD’s explaining the ‘evidence’ for mermaids. After calming down and assessing the myriad issues I realized our students could explain why the ‘evidence’s doesn’t reflect the selective pressure of life underwater. I’m sure these programs will only serve to make the work of teaching science more difficult. At least the mermaid makes for a good Zygoma post! Thanks Paolo! I’ve seen the atrocious mermaid work by Animal Planet and was deeply annoyed by it. In fact, I ranted about it for Monster Talk one time: http://www.skeptic.com/podcasts/monstertalk/12/08/22/ and have been doing talks around the UK where I thoroughly lay into the bad science it relies on! Paolo, I’m glad I have your support as we struggle to support science. I visited the Monster Talk page and found it very interesting indeed. I showed the picture of the mermaid to my wife. Her response was not what I expected. “Oh, I’ve seen three of those before” “What!? !” “At Ensor’s house.” She has been working on (paper conservator) a print by the Belgian artist James Ensor for several years. In her research into his techniques she had a chance to visit his home in Ostend. His family sold shells from their house apparently and the three mermaids are there today. I love the world of science, museums, and the odd!! Daniel Jones will tweet the picture to you since my digital skills are lacking. I hope you enjoy it! Well, if you do not want a selfie with a mermaid, you can at least date her — get my point? I can’t wait to read more. I always assumed this to be a circus side-show curiosity. Whatever it is, it looks creepy! The side-show examples were based on the original specimens that represented ningyo from Japanese folklore. Whoa! This is the coolest! I remember seeing pictures my uncle brought back from some museum (sideshow?) exhibit he had gone to when I was really little, and he had all these stories about the Sasquatch and the Fiji Mermaid pictures and how they had been captured and stuffed. …depending on your findings, maybe I WILL believe him! Heh heh. Isn’t that a nomen nudum? is popping it up all over the web without my agreement. Do you know any methods to help prevent content from being ripped off?